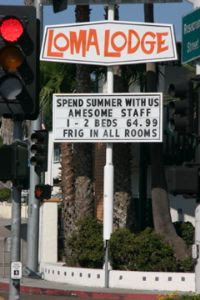 When visiting San Diego's Point Loma community, please be sure to stay at the Loma Lodge. Being able to frig in all the rooms, your visit is sure to be a memorable experience. And remember, they have an "awesome staff." Haha! I see this sign almost every day. The Loma Lodge has gotten "hip" again after many years as a no-tell motel. They now host dive-in movies in their pool. Never tried to frig there though.